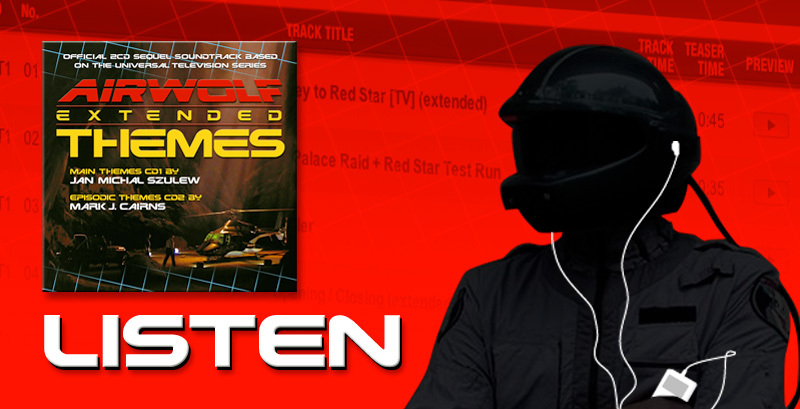 Listen Airwolf MP3 teasers for all the Airwolf Main Theme tracks and Airwolf Episodic tracks from the 'Airwolf Extended Themes' 2CD soundtrack. With 42 music tracks covering the show's original 3 seasons on the CBS network, the first CD1 of the 2CD set is produced by Orchestrator and Associate producer, Jan Michal Szulew; with the second CD2 of the set arranged by Airwolf Themes' producer, Mark J. Cairns. The first CD1 was created to show off the many variations of the Airwolf Main Theme tune originally created by composer, Sylvester Levay with other Airwolf Main Theme variants composed by episodic composers Udi Harpaz and Ian Freebairn-Smith. The second CD2 was arranged and produced to celebrate the weekly episodic music of Levay, Harpaz, and the late Bernardo Segáll. Available as a Special Limited Edition 2CD soundtrack set the Airwolf Extended Themes soundtrack is available to Buy NOW. Click HERE for more details. Available as a Special Limited Edition 2CD soundtrack set the Airwolf Extended Themes soundtrack is available to Buy NOW. Click HERE for details.